Lake Bratan is one of the most beautiful lake in Bali, perhaps in the world. The Lake is the best place to sightseeing tours in Bali. It's because of the stunning lake, the holy temple, story and tradition, blue-green mountains, tranquil surroundings and the coolness atmosphere. The beautiful water temple with its floating illusion combined with stunning scenery of The Lake, in the backdrop setting of blue-green mountain is the most exotic moment to captured by visitors. Let's take a closer look to the Lake Bratan! 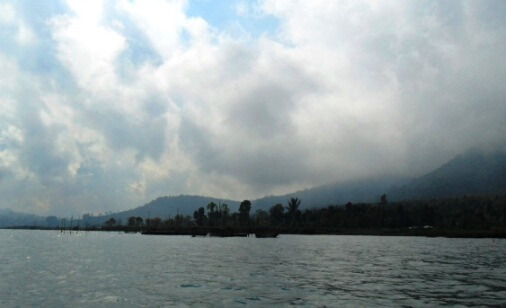 Bratan Lake is located at the eastern rim of Bedugul Caldera. 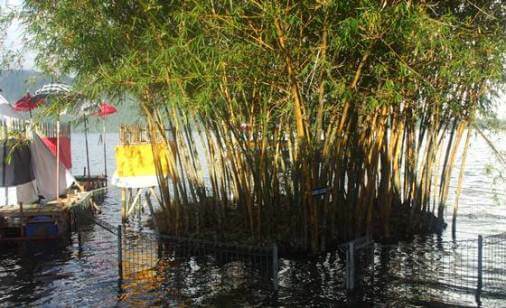 The lake water area cevered an area of 375,6 hectares with average depth of 22-48 meters. You can visit this place by travel car, taxi or rent a car. It's about 50 minutes from Singaraja City (28 Kilometers), 1 hour from Tabanan City (36 Kilometers), 1 hour 30 minutes from Denpasar City (52 Kilometers). But if you go straight from Ngurah Rai International Airport it took 2 hours (64 Kilometers) until you arrive at this lake. The Lake and its surrounding are influenced by cold tropical climate because of its location at an altitude of 1240 above sea level. Cool breeze at the daylight is a common in Bedugul area including The Lake. Average temperature about 10-24 degrees Celsius. The humidity is particularly high. Bratan Lake is renowned as The Lake of Holy Mountain not for no reason. Local people in Bedugul are farmers. Locals is very grateful for the blessings given by God (Hyang Widhi), a fertile volcanic soil from the mountain and abundant of water source from this lake. In addition, from the viewpoint of Hindu beliefs, mountains and lakes is something sacred and respected. So it's not a surprised if people call Bratan Lake as The Lake of Holy Mountain. 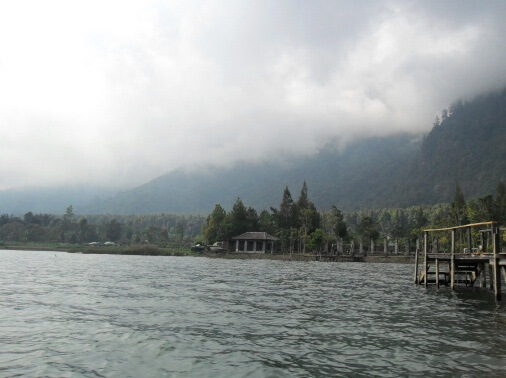 Bratan Lake or Danu Bratan is one of The Four Great Lake in Bali including Lake Buyan, Lake Tamblingan and Lake Batur. 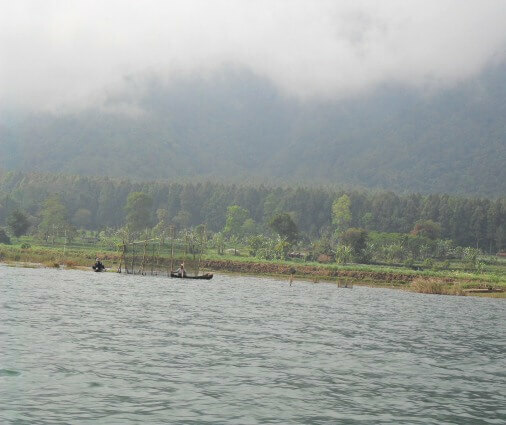 Lake Buyan and Lake Tamblingan is located in Bedugul which part of Buleleng Regency. Lake Batur is located in Kintamani, Bangli Regency. Bratan Lake itself is located in the Bedugul Area part of Candikuning Village in the District of Baturiti, Tabanan Regency, Bali. Sightseeing tours in Bali especially in Bratan Lake will give the visitors a great experience to see one of the most beautiful lake in Bali, the Holly Water Temple with Golden Bamboo (surrounded by lake water), blue-green mountain, tranquil surroundings and the coolness atmosphere. While the weather is clear in the morning, Bratan Lake offer the visitor its precious moment to captured. The beautiful "water temple" with its floating illusion combined with stunning scenery of the lake, in the backdrop setting of blue-green mountain is the most exotic moment to captured by visitors. You shouldn't miss this beautiful temple on your sightseeing tours in Bali. Bratan Lake is close to other tourist spot such as The Bali Botanical Garden (Kebun Raya Eka Karya or Kebun Raya Bedugul), Lake Buyan, Lake Tamblingan, Bukit Munggu Traditional Fresh Market and Mount Catur (Puncak Mangu, nice place for hiking). As a tourist destination, this area is also facilitated with accommodation service such as hotels, villas, restaurants, and parking lot. Ulun Danu Beratan Temple or Pura Ulun Danu Bratan is located on the western shores of this amazing lake. The temple can give the illusion of actually floating on the water. The water temple offer the best iconic images of Bali to the visitors. The temple was build before 1556 saka (or 1634 AD) by the First King of Mengwi Kingdom I Gusti Agung Putu. 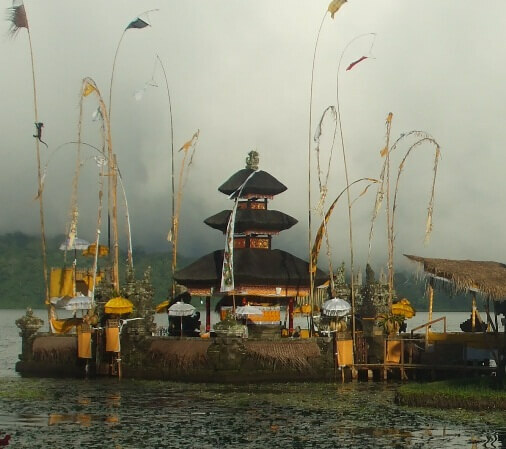 Pura Ulun Danu Beratan Temple is consist of 4 temples complex and there is also Buddha statue and small pagoda. The temple complex consist of Pura Penataran Agung Puncak Mangu, Pura Telengin Segara, Pura Lingga Petak, Pura Dalem Purwa, and Pura Taman Beji. In the area of Pura Penataran Agung Puncak Mangu there are several shrines. One of them is Meru tumpang 7 (seven level roof-overlapping temple) namely Pasimpangan Pura Puncak Teratai Bang serve as Stana to worship the god Brahma. The actual Pura Puncak Teratai Bang is located inside the area of Eka Karya Botanic Garden. The other shrines include Pesimpangan Pura Puncak Bukit Sangkur, Pelinggih Padma Tiga, Pelinggih Ratu Pasek, Pelinggih Ratu Pande and several other shrines. Pura Telengin Segara or Tengahing Segara has shrine or Meru tumpang 11 (eleven level roof-overlapping temple) serves as Pesimpangan Bhatara in Puncak Mangu (Mount Pangelengan). 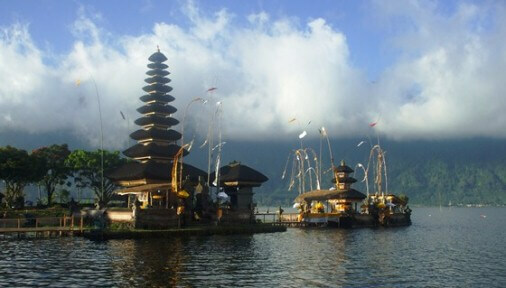 The temple is dedicated to worshiping Vishnu and Ida Batari Dewi Ulun Danu (goddess of the lakes, and rivers). Locals annually held an offering ceremony as a symbol of gratitude to the Goddess Danu for the water sources that provide fertility has. This temple is surrounded by the water of the lake. Pura Lingga Petak is located in the eastern side of Pura Telengin Segara. This temple has Meru tumpang 3 (three level roof-overlapping temple) and exit gate at the four cardinal directions. There is ancient relic (Lingga) stored here. The temple is dedicated to worshiping Shiva. Pura Dalem Purwa is located in the south Penataran Pucak Mangu. This temple is dedicated to the worship of The Goddess Durga. The shrines in this temple entirely facing the east. Pura Taman Beji functioned as a place to invoke holy water at the time of piodalan. This temple is also a place to held melasti ceremony to several areas such Baturiti, Candikuning, Marga, Mengwi and several other areas. Lake Bratan is a place for melasti ceremony to the communities around the lake. Several sacred objects such as statues pratima, pralingga, tedung, lelontek, umbul-umbul, payung rob-rob, payung pagut and other brought to Pura Taman Beji. Melasti ceremony is performed every year in the ninth month of Balinese calendar or "sasih kesanga". The purpose of this ceremony is to eliminate suffering, dirtiness of the world and invoke the purification from the water. Lake Bratan melasti ceremony is held at Pura Taman Beji. After the ritual, the sacred objects is brought to Pura Dalem Purwa and Penataran Agung. But there is also execution of melasti ceremony only performed in Pura Taman Beji. Pekelem ceremony was addressed to Ida Betari Dewi Ulun Danu to invoke fertility and abundant of harvests. Pekelem ceremony is performed once a year at the full moon of the seventh month of Balinese calendar or "Purnama sasih Kepitu". The pekelem ceremony is devided into "Pekelem Alit" or "Pekelem Supreme". Pekelem Alit is usually using ceremony with animals such as chickens, ducks and rice plants. Pekelem Agung has a higher level with the ceremony and the animals such as buffalo, cow, turtles, ducks, geese and others. Pekelem ceremony is symbolic expression of devotion and gratitude to the Creator. This ritual is always remembering us about the importance values of the lakes in the joints of human life. Lakes as water resources plays a very important role of both physical and spiritual, so must constantly maintained, cared for and respected. The lake plays an important role as a main source of irrigation (subak) in the central part of Bali such as Tabanan, Badung and Denpasar. The water of the lake appears as a spring. Then follows the river flows into the irrigation canal and provide fertility in rice fields. The residents of subak in the middle of Bali (subak in Tabanan, Badung and Denpasar) who get water from the Bratan Lake always perform ceremonies such as Nangluk Merana, Ngaturang Suinih and Pekelem Ceremony. The ceremonies as an expression of devotion and gratitude to the Creator, reduce pests and harvest plentiful. Subak region that get the water flow from Lake Beratan gathered in groups called "pesedahan". Pasedahan coordinate with several groups of Subak and collect fees that will be used to finance the ceremony. Irrigation water management system or Subak in Bali has been proven to be effective, efficient and durable over the last 1000 years. Subak also has strengthened communication between its members and minimize conflicts. Take your time to travel to Lake Bratan Bali, hopefully helpful and thank you!